While Bela Fleck and the Flecktones enjoyed a year off from the trials and tribulations of touring, they also found time for a variety of new endeavors; Fleck journeyed to Africa to record and discover the roots of his beloved banjo, and bassist Victor Wooten and saxophonist Jeff Coffin led their own groups on tour. 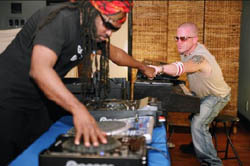 Roy "Futureman" Wooten, the eclectic percussionist of the group, led his own trio, the self-titled "Futureman Project", combining his electronic drumming with jazz hip-hop keyboardist Jeremiah "Street Maestro" Able, and guitarist Robert "Area 51" Provine". Wooten's use of his "Drumitar", (a guitar synthesizer he converted into a drum machine), his "Roy-el", a custom piano sampler, turntables and more, made for quite an interesting blend of jazz, improvisation and hip-hop. In 2005, Wooten wrote, " I have a year to explore some different directions in music. The first is the concept of what a DJ is. As a musician, I’ve realized that we live in the age of the DJ. As an artist, I’ve realized that I want to create music with the tools of a DJ, i.e. turntables, drum machines, samplers, computers etc. Through the process of implementing these new tools along with instruments that I have created, I seek to implement what being a DJ can mean in the evolution of music. For a period of time being a DJ meant spinning records, to us it means “jockeying”, or manipulating audio that is in a digital format. As far as the term Binary Composer, this refers to the creation of music that sounds “classical”, yet is written solely on “virtual instruments”. "As a composer it is a privileged time to be alive! The advancements in computer audio are opening creative possibilities that never existed. The binary composer project will explore the marriage of traditional instruments and modern synthesis in both recorded and performed formats." Wooten added Able, a Nashville native well versed in jazz, R&B and hip-hop to round out his vision. Able was dubbed the "Street Maestro" by Wooten, for "one ear turned to the symphony and the other to the block". Provine joined the combo for a only a few shows, however his ethereal guitar work made an interesting project all the more exciting. Covers of Miles Davis and Curtis Mayfield tunes, even Erykah Badu often filled their set lists. Wooten and Able's rappin' breathed new life into some of these classics, not to mention the virtuosity and deft improvising on display. With the Flecktones back from hiatus, we may not see this line up again for sometime, although Victor Wooten plans on coming to the Fillmore again soon. Futureman's tour was very brief, and mainly confined to the east coast and Nashville, home of the Flecktones, however, more artists and musicians should be encouraged by this blend of genres, and the ability to converse with a much wider audience.